3000 hours engine use since rebuild in 2000. Video of engines being started from cold showing oil pressures and also sown at running temps from both upper and lower hemp positions are shown in the media section. Taken out of the water every 3 years to have hull cleaned, 5 primer coats, 2 intermediary coats and 2 topcoats below water line. Last out 2017 when re surveyed. Length of hull in the water is 40ft. Dutch Steel cruiser kept in good condition by her previous owners. She is a very clean boat with exceptionally clean engines and bilges. 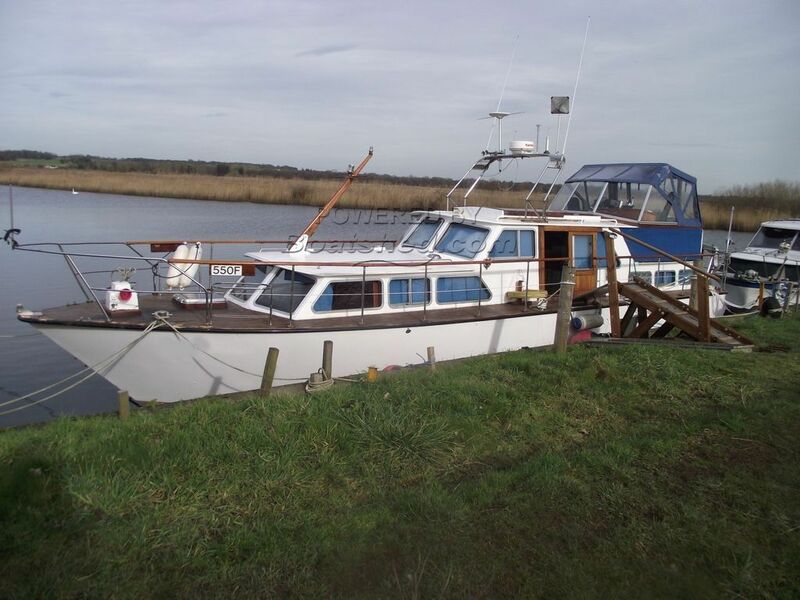 She is currently used a s a "live aboard" by her current owners and she is an ideal long stay cruiser with 2 heating systems, and 240v shore power. A good size galley with 4 burner cooker is on the port side opposite a newly created dining area. The current mooring is available should the new owner wish to keep her in her present location near Loddon Norfolk. This boat has a very welcoming feel and is an ideal retreat either permanently or to escape the busy lifestyle. She is Broads Licensed and has a BSC until 2022.
aboard this boat has to be seen. There is a full photographic record of the intensive upkeep of this boat along with original manuals, service history and so on. She has new upholstery, had blinds fitted to all windows and had 2 new electric toilets fitted. The mooring is available at a cost of only £1600 per annum. You could be living aboard for an all in cost of only £50 per week! This De Groot 42 has been personally photographed and viewed by Geoff of Boatshed Norfolk. Click here for contact details. Please note this comments section is public. Please do not post your personal details here. To enquire about purchasing this boat, please contact the broker directly at geoffjaquest@boatshednorfolk.com. Please read our commenting guidelines before posting.